A boy must escape a world where the processed food is killing his neighborhood — literally. SHARE to teach kids who is behind it, and how to escape. Here’s sharing this interesting video I just came across which I found to be extremely well made in terms of music and video production, and it carries a very important message to bring awareness to the general public about the dangers of processed food, GMO food and energy drinks, and the insidious agenda of most processed food and pharmaceutical industries. Hello. My name is Birke Baehr, and I’m 11 years old. I came here today to talk about what’s wrong with our food system. First of all, I would like to say that I’m really amazed at how easily kids are led to believe all the marketing and advertising on TV, at public schools and pretty much everywhere else you look. It seems to me like corporations are always trying to get kids, like me, to get their parents to buy stuff that really isn’t good for us or the planet. Little kids, especially, are attracted by colorful packaging and plastic toys. I must admit, I used to be one of them. I also used to think that all of our food came from these happy, little farms where pigs rolled in mud and cows grazed on grass all day. What I discovered was this is not true. 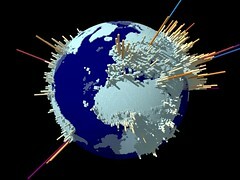 I began to look into this stuff on the Internet, in books and in documentary films, in my travels with my family. I discovered the dark side of the industrialized food system. First, there’s genetically engineered seeds and organisms.That is when a seed is manipulated in a laboratory to do something not intended by nature — like taking the DNA of a fish and putting it into the DNA of a tomato. Yuck. Don’t get me wrong, I like fish and tomatoes, but this is just creepy. (Laughter) The seeds are then planted, then grown. The food they produce have been proven to cause cancer and other problems in lab animals, and people have been eating food produced this way since the 1990s. And most folks don’t even know they exist. Did you know rats that ate genetically engineered corn had developed signs of liver and kidney toxicity? These include kidney inflammation and lesions and increased kidney weight. Yet almost all the corn we eat has been altered genetically in some way. And let me tell you, corn is in everything. And don’t even get me started on the Confined Animal Feeding Operations called CAFOS. Conventional farmers use chemical fertilizers made from fossil fuels that they mix with the dirt to make plants grow. They do this because they’ve stripped the soil from all nutrientsfrom growing the same crop over and over again. Next, more harmful chemicals are sprayed on fruits and vegetables, like pesticides and herbicides, to kill weeds and bugs.When it rains, these chemicals seep into the ground, or run off into our waterways,poisoning our water too. Then they irradiate our food, trying to make it last longer, so it can travel thousands of miles from where it’s grown to the supermarkets. So I ask myself, how can I change? How can I change these things? This is what I found out. I discovered that there’s a movement for a better way. Now a while back, I wanted to be an NFL football player. I decided that I’d rather be an organic farmer instead. (Applause)Thank you. And that way I can have a greater impact on the world. This man, Joel Salatin, they call him a lunatic farmer because he grows against the system. Since I’m home-schooled, I went to go hear him speak one day. This man, this “lunatic farmer,” doesn’t use any pesticides, herbicides, or genetically modified seeds. And so for that, he’s called crazy by the system. I want you to know that we can all make a difference by making different choices, by buying our food directly from local farmers, or our neighbors who we know in real life. Some people say organic or local food is more expensive, but is it really? With all these things I’ve been learning about the food system, it seems to me that we can either pay the farmer,or we can pay the hospital. (Applause) Now I know definitely which one I would choose. I want you to know that there are farms out there — like Bill Keener in Sequatchie Cove Farm in Tennessee — whose cows do eat grass and whose pigs do roll in the mud, just like I thought. Sometimes I go to Bill’s farm and volunteer, so I can see up close and personalwhere the meat I eat comes from. I want you to know that I believe kids will eat fresh vegetables and good food if they know more about it and where it really comes from. I want you to know that there are farmers’ markets in every community popping up. I want you to know that me, my brother and sister actually like eating baked kale chips. I try to share this everywhere I go. Not too long ago, my uncle said that he offered my six-year-old cousin cereal. He asked him if he wanted organic Toasted O’s or the sugarcoated flakes — you know, the one with the big striped cartoon character on the front. My little cousin told his dad that he would rather have the organic Toasted O’s cereal because Birke said he shouldn’t eat sparkly cereal. And that, my friends, is how we can make a difference one kid at a time. So next time you’re at the grocery store, think local, choose organic, know your farmer and know your food. Thank you. Below is a list of “five myths about genetically modified food” by Greenpeace. If you live in the United States of America (USA) and you would like to order online organic produce to be delivered to your doorsteps, you may like to visit this website called Full Circle. You will not only be getting groceries that are organic, local, sustainable, green, and in season, you will also be supporting small business. Do we have the right to know what’s in our food? According to Wikipedia, genetically modified foods (GM foods, or biotech foods) are foods derived from genetically modified organisms (GMOs), such as genetically modified crops or genetically modified fish. GMOs have had specific changes introduced into their DNA by genetic engineering techniques. This website summarises the benefits and controversies of GM products. 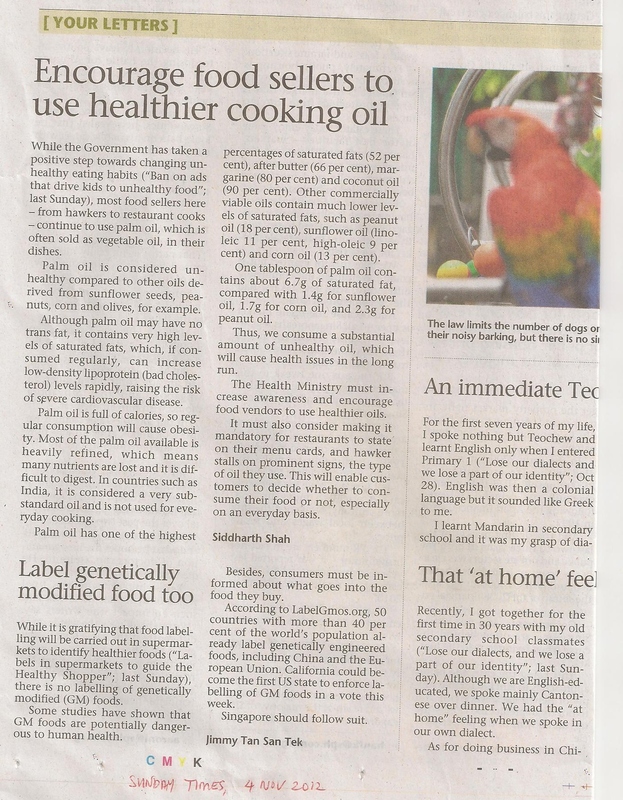 Recently, I came across this newspaper article about food labelling in supermarkets in Singapore to encourage people to buy healthier food. While that is good, I realise there is no GMO labelling implemented yet. So I decided to email the following letter to the newspaper to highlight the issue. I had also hoped that the Proposition 37 on GMO labelling of foods in California would come into fruition on 6 November 2012, as Singapore and other countries tend to follow America’s lead in many areas of life. I refer to the article “Labels in supermarkets to guide the Healthy Shopper” published in The Sunday Times on 28 October 2012. While it is good to know that food labelling will be carried out in supermarkets to identify the healthier foods to encourage consumers to buy more of them, there is no GMO labelling of genetically modified (GM) foods implemented in Singapore yet. This is a worrying trend because more and more studies have shown that GM foods are potentially dangerous to human health. For example, the Health Ranger of NaturalNews Network, a non-profit collection of public education websites, explained in his video entitled “How GMO foods alter organ function and pose a very real health threat to humans” that cell research shows that the microRNA in GM foods may alter organ functions in the human body by changing the biological information and suppressing natural functions in vital organs, which may in the long run cause cancer tumours, infertility and so on. 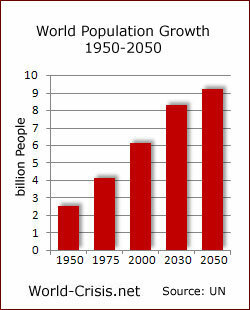 It is useful then for more people to be aware of the dangers of eating GM foods. According to the Institute of Responsible Technology, the American Academy of Environmental Medicine (AAEM) reported that “Several animal studies indicate serious health risks associated with GM food”, including infertility, immune problems, accelerated aging, faulty insulin regulation, and changes in major organs and the gastrointestinal system. The AAEM has also asked physicians to advise patients to avoid GM foods. Besides, we all have the right as consumers to know what is in our food. According to LabelGmos.org, 50 countries with over 40% of the world’s population already label genetically engineered foods, including China and the entire European Union. Even in America, California is looking set to become the first US state to enforce labelling of GM foods, in a vote on 6 November 2012. It is therefore high time for Singapore to follow suit to give consumers the right to know what is in their food. As noted by our Health Minister Gan Kim Yong, the Health Promotion Board (HPB) has shown “our Government’s seriousness in creating a healthy nation”, so I see no reason that the food labelling programme would stop at identifying healthier foods and exclude GMO labelling. I strongly urge the relevant authorities to seriously consider implementing GMO labelling in Singapore for our health’s sake. My letter was published on 4 November 2012 in The Sunday Times entitled “Label genetically modified food too”, which has been edited and truncated, probably for brevity. As of today, it has been reported that the Proposition 37 to label GMO foods in California has failed, since the number of people who voted “No” had slightly outnumbered those who voted “Yes” on 6 November 2012. Nevertheless, there is still hope since at least the campaign has raised awareness among more people about the GMO issue. The YES on 37 campaign also forced Monsanto and the biotech giants to spend $45 million to defeat the measure. That’s a record expenditure by the world’s largest toxic pesticide companies to try to prevent consumers from knowing what they’re buying. Remember: GMOs are the only products that consumers accidentally purchase without knowing what they’re buying. What’s clear from all this is that GMO labeling has a foothold in the minds of American consumers, and this effort to label GMOs is going to be repeated state after state, year after year, until victory is achieved. Prop 37 and GMO Foods: Yea or Nay?